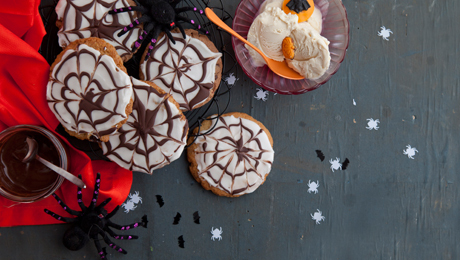 A spooky and fun recipe to try with the kids! In a bowl, following the pack instruction, combine until a soft dough is achieved. Divide the dough into walnut size pieces and transfer to a parchment lined baking tray. Bake for 12-15 minutes or following the package instructions. In a small bowl, combine the icing sugar with egg white and some lemon juice until correct consistency. Place the chocolate pieces into a bowl over a pan of simmering water and melt. Drizzle the cookies with the white icing, then swirl the dark chocolate in a circular fashion over the white icing, then using the tip of a cocktail stick make a web pattern by dragging the tip through the dark chocolate. Leave to set of 30 minutes before serving.